A spectacular day’s racing in the Alps saw a popular French winner and the battle for the yellow jersey narrowed to two men. One yellow jersey, just two men left who can win it. The 2011 Tour de France hangs precariously in the balance, with only the Grenoble time trial to come, after the favourites fought each other to the point of exhaustion in a day of attacking verve. Today was the day the racers took back the Tour. Andy Schleck will sleep in the yellow jersey tonight, with a lead of 57 seconds over Cadel Evans. Frank Schleck separates the two, four seconds ahead of Evans, but his time trialling weakness means that he might be better defending third place than trying to win second. And while Evans is the better time triallist, neither will be confident of victory. Evans has still left himself with a lot to do, while Schleck might not have done enough. Evans shouldn’t be confident. Schleck should be scared. Seconds will separate them in Paris. It was as if the two skirmishes on the descents to Gap and Pinerolo and Andy Schleck’s daring long-range attack on the Col d’Izoard yesterday have unblocked the peloton. Riders have realised that hiding behind their teams results in a stalemate, and instead of racing by proxy, the favourites have spent the last four days fighting each other, with increasing intensity, and fewer inhibitions. As a result the 2011 Tour has suddenly elevated itself from a good, close race into one of the all-time classics. Today was a day for heroes. Alberto Contador, the fallen champion, detonated the race with an attack just a few kilometres into the Col du Télégraphe. Andy Schleck went with him, his new-found sense of adventure not dulled by his efforts of yesterday. Yellow Jersey Thomas Voeckler tried to follow and found himself in a terrible, exposed no-man’s land between the Contador-Schleck tandem and the safety of the peloton, yet fought all the way to the top of the Galibier, and incredibly managed to chase on by the bottom of Alpe d’Huez. He had no hope of ending the day in the yellow jersey, but he honoured his position by fighting all the way up to the summit, the whole of France willing him on. Pierre Rolland, finally let off the leash, won the stage – France’s first this year – and took the white jersey. It was just reward for the loyal defence he has made of Voeckler’s race lead. Samuel Sanchez found the fastest way down the Galibier and bridged to the Contador-Schleck group, then found the strength to chase and catch Contador on Alpe d’Huez after a backbreaking effort. And Cadel Evans initially followed Contador and Schleck, but a mechanical problem saw him drop back, before he took responsibility for the chase all the way up the Télégraphe and Galibier, and down the other side. These riders have left an indelible impression on the memory of the Tour. But there’s one more thing: Rolland’s winning time up the Alpe was recorded at 41-20, almost four minutes behind Marco Pantani’s record time, and three minutes short of the times regularly recorded through the 1990s and 2000s. This is a believable Tour, both in the style of racing through the Pyrenees, and the times recorded up to the summit finishes. We were warned that the price of a much cleaner peloton might be a duller sense of adventure among the favourites, and the Pyrenees, where they rode up to Luz Ardiden and Plateau de Beille together, followed this pattern. But the Alps have been inspirational, a perfect advert for the sport. First the peloton needed to learn to race clean. Once it did that, it needed to learn to race. The evidence of the last four days is that it has done both. There was barely time for the early break out of the start in Modane to take stock, work out who was there, and organise themselves into a paceline before the race hit the Col du Télégraphe. 14 riders managed to build a lead of a couple of minutes, before Contador went on the attack. The Col du Télégraphe may have been the easiest of today’s three climbs, but it’s deceptively tough, relentlessly climbing at a pitch just short of extremely steep. And you could tell Contador meant it when he went. The Schlecks and Cadel Evans realised the danger, and chased him. Thomas Voeckler followed a little later, but he made heavy going of the pursuit. Frank Schleck fell back, either unable to follow the pace, or following team orders to save himself in case Contador was trying to blow himself up and take down as many innocent victims as he could. Ivan Basso didn’t even try to follow. Behind, Basso put Sylvester Szmyd to work. Liquigas-Cannondale were using the old tactics – get your team-mates to set a steady pace up the climb, and try not to hit the front until the final mountain. But times have changed – the race was going away from them. Contador picked his way through the stragglers of the escape group, and simultaneously got rid of Voeckler, to fatigue, and Evans, to a mechanical. Evans felt there was something wrong enough with his bike that it was slowing him down considerably. Voeckler just looked as if that was the case. Voeckler had put himself into a difficult situation. Ahead, Contador and Schleck were moving steadily clear. Behind, the BMC-led peloton wasn’t making inroads into the lead. He could sit up and wait, and hope that Contador was bluffing, or try and chase him down. The wrong decision in these cases is so often the one that looks more spectacular: he put his head down and set off in pursuit. Voeckler was briefly aided by ex-team mate Jérôme Pineau over the Télégraphe’s summit, then solo again on the heartbreakingly straight, steep early slopes of the Galibier. Behind, the race had blown to smithereens. Few of the favourites had any team-mates left in the peloton (which was hardly worthy of the name), and even fewer had men capable of assisting. And like yesterday, Cadel Evans took responsibility for the chase. The horrible, slow-motion pursuit match evolved over the middle and higher slopes of the Galibier. Contador and Schleck, shadowed by non-participating spectators Rui Costa and Christophe Riblon, forged ahead, while Voeckler slowed and slowed, until he was caught by the peloton, then dropped. While Sanchez attacked over the top of the Galibier, knowing that a good descent could see him at the front of the race, Voeckler, red-faced from the effort, was pedalling almost to a standstill. Team-mates Anthony Charteau and Vincent Jérome paced him, but it was heartbreaking to watch the gap growing and his final grip on the yellow jersey being prised off. Don’t be fooled by the public image of Thomas Voeckler. He’s sold as a cherubic, cheeky imp, and he’s popular with cycling fans not just for his riding, but for the fact that he lets us into his world. We’ve all shared his joy, attacking spirit and sense of fun over the last two weeks. But he’s as driven a character as any in cycling, and as he shouted and yelled in frustration at his inability to follow on the Galibier, we shared his anguish too. This wasn’t 2004, when every day in yellow was a bonus. Thomas Voeckler wanted to win this race, and his reaction to his situation on the Galibier proved it. While the climbs of the Télégraphe and Galibier were fertile grounds for attacking, the long, exposed, shallow descent of the Lautaret favoured defensive riding, and inexorably, the disparate groups formed on the climbs coalesced into one. First, Sanchez caught Contador and Schleck, then the small Evans group joined them. In the Evans group: Arnold Jeanessen, still a contender for the white jersey, along with his FDJ team-mate Sandy Casar. Casar worked his socks off to bring the group up, helping Evans with the chase. Behind, Voeckler had three team-mates to do the work, and white jersey holder Rein Taaramae also put Cofidis team-mate David Moncoutie on the front to help chase down Jeanessen – they mopped up Ivan Basso, then caught up with the front group just a few kilometres before the Tour hit Bourg d’Oisans and the base of the Alpe. The Frenchman had closed a two minute gap from the top of the Galibier. Incredibly, after all the attacking, a group of 30 or 40 riders hit the climb together, just behind Rolland and Hesjedal, who’d attacked two kilometres previously. And as the first slopes of the Alpe began to bite and grab at the riders’ legs, they each settled into their private hell, and the long grind to the top. There would be little tactical subtlety now – the favourites had ridden almost to the point of exhaustion. Every man for himself. Contador, inevitably, went first, quickly joining Rolland. The Spaniard accelerated hard at 12.5 kilometres to go, 12.2 kilometres to go, 12 kilometres to go and 11.4 kilometres to go. Each time, he dropped more riders, and the final attack shed Rolland. Behind, Evans had put the Schlecks into trouble with an attack, but the brothers slowly pulled him back. It was now dangerous for Andy Schleck – ahead, Contador was building a lead of a minute. Another 90 seconds on top of that, and he’d start looking like a threat to the yellow jersey. And with him: Cadel Evans. The BMC rider would only have to stay with him to the top, and then the advantage would shift from Luxembourg to Australia, with the time trial in the offing. 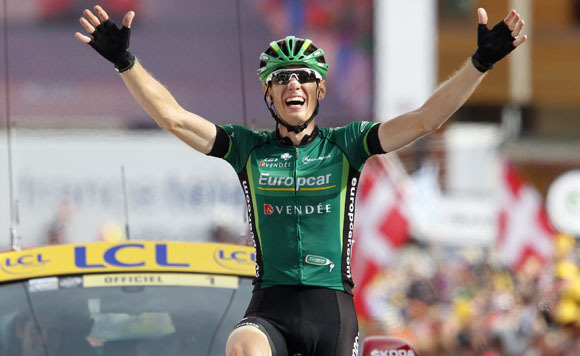 Behind, Voeckler’s dream was finally over, lost in the hollering, baying crowd. Samuel Sanchez took off in pursuit with 8.5 kilometres to ride. A tantalising trio of possibilities dangled in front of him: a stage win, if he could catch Contador; a move up the GC, if enough riders behind him lost time; and the climber’s jersey. Possibly all three. How quickly fortunes change on the Alpe. With five kilometres to go, Contador looked comfortable. With four to go, his jerky, fast-moving pedalling style suddenly looked laboured, and Sanchez and Rolland, temporary allies in war, were closing him down. And with two and a half to go, the bridge was made. Contador looked spent. So did Sanchez. So too did Rolland, but the young Frenchman somehow summoned up the last few remaining drops of motivation and energy left inside him, and put them all into two accelerations. The first got rid of Sanchez and the second killed Contador. Rolland was the first French winner on the Alpe since Bernard Hinault in 1986. It’s been almost as long since we’ve seen such open, devil-may-care attacking in the Tour de France. Behind him, the Schlecks and Evans remained inseparable, sprinting in together, while Voeckler spent his last few minutes in yellow with the admiration and respect of the entire Tour de France to accompany him up the finishing straight. Sanchez won his polka dot jersey, while there was even action in the green jersey competition as both Mark Cavendish and Jose Joaquin Rojas finished outside the time cut and were docked points. But while the day was exciting, it wasn’t decisive. It’s ironic that after the delicate stalemate of the Pyrenees and the intensity of the racing in the Alps, that the Tour will come down to a time trial. All eyes will be on two men, in a battle that is more finely balanced than some would believe. Will Andy Schleck’s 57-second lead over Evans compensate for his comparative weakness in the event? Or will the tiredness of three weeks’ racing level the playing field enough for him to win? Although he has taken responsibility for keeping himself in the race, all Cadel Evans has done until now is try not to lose the Tour. Tomorrow he’s going to try to win it.